Our first work day started a little later than normal, as we did not need to be at the worksite until ten. After another wonderful Mike Dinsmore meal for breakfast, and a morning devotional from Don “Gramps” Meyer, the four groups all headed to their respective worksites to begin the day. 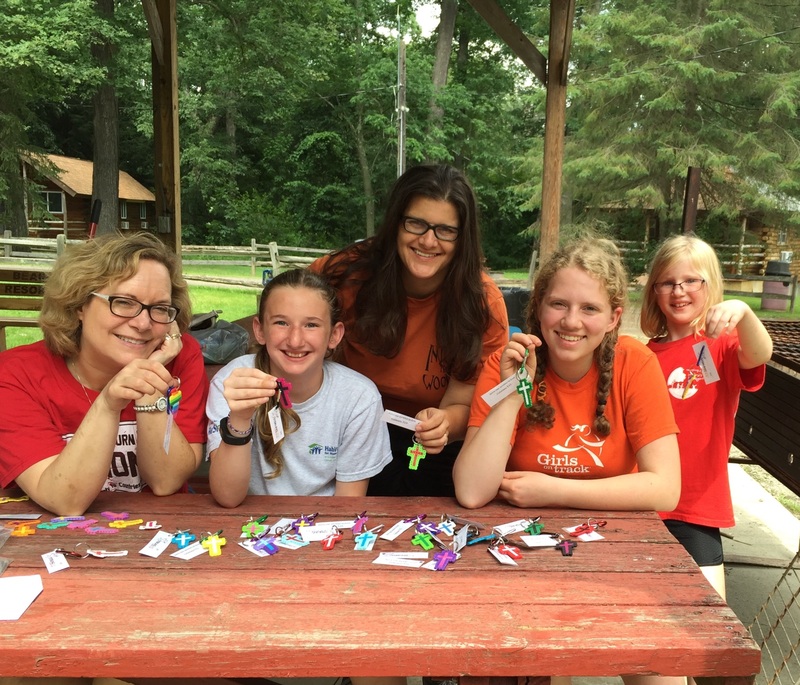 Two small groups headed out to work at local churches here in the Canton area, while another small group stayed at the campsite to make arts and crafts to give to the homeowners and habitat workers at the end of the week. The main group headed to go do paint and carpentry work at a local house through Hammer and Nails, a Christian outreach program that helps rebuilds houses in the area. As we were unable to work through Habitat today, it was a blessing to find other opportunities to serve the local community in and around Canton on Monday. One of the small groups went to Crystal Park United Methodist Church. After meeting with two of the church’s trustees, the team started work on three of the staircases within the building. Many of the church staff is elderly, and the concrete stairs were a safety hazard, as they would often get too slippery to walk on. Before being able to repaint the stairs with paint that was gritty to provide traction, the stairs needed to be scrubbed and washed. This is where the SUMC team came in. After a several hours on their hands and knees with rubber gloves, soapy water, and scrub brushes, the small team rejoined the paint crew for the last half of the day. Another small group went to St. Paul’s Episcopal Church in Canton for some general cleaning. The facilities were large enough that the small church staff needed help with keeping it clean. This required the team to clean the church windows, and sweep and mop the floors. The team managed to clean the church’s hallways, several classrooms, and the church gyms. They then went to a local park nearby to have their lunch, where they made friends with a little squirrel. 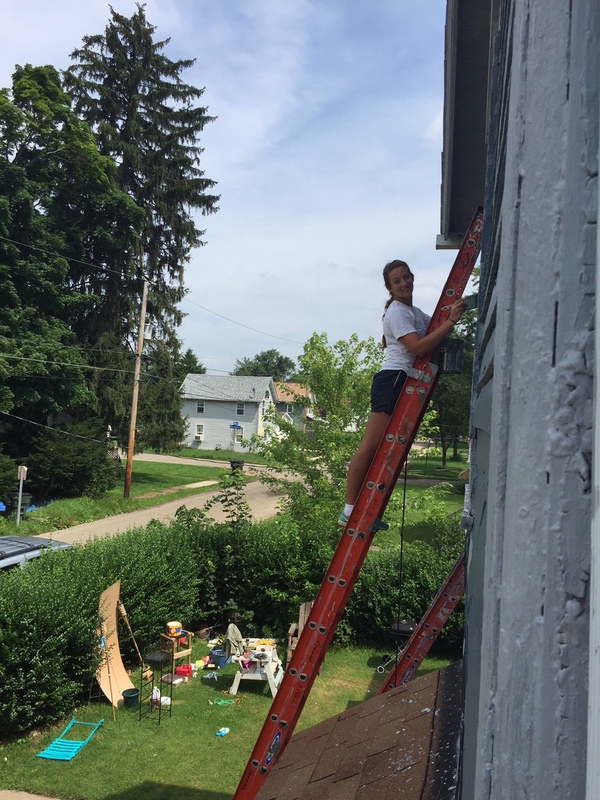 The main group went to the Ware household in Massilion to work with the Christian outreach program Hammer and Nails. 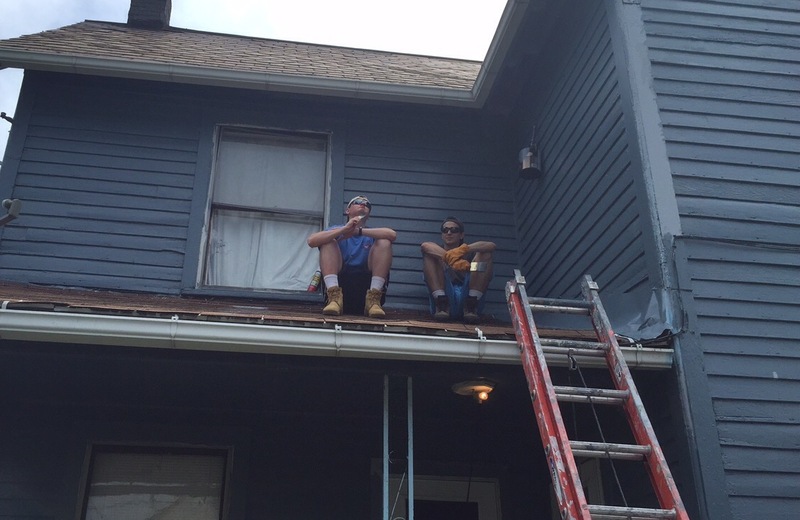 Much like Habitat for Humanity, the group provides construction help to local families, all through a desire to spread Christ’s love to the community. The difference with them and Habitat being mainly that while Habitat focuses on building new houses, Hammers and Nails seeks to help “rebuild” local homes by helping fix current problems and issues. Today’s work required the team to scrape off prior paint jobs, prime and paint the house, trim the windows, and even put up some new siding for the back side of the house. This lead to a long, but meaningful day of being Christ’s hands, as the team was able to fellowship, build, and even meet with the homeowners’ daughter. The transformation was magnificent, as the house changed remarkably in a few short hours, and God even blessed us by holding off the rainstorms that were heavily predicted. Once again He provides. The group that stayed back at the campsite had a wonderful, fun filled day. They made bead cross key chains, as well as coffee filter flowers to put inside of SUMC coffee mugs. Both will be given to the homeowners and habitat workers on Friday at a banquet Habitat throws for the SUMC team. There we will celebrate both the work SUMC and Habitat has done throughout the week, as well as the continual work that Habitat does for the community. Giving gifts to the homeowners and Habitat workers that are made by the SUMC team is a Canton Team tradition, as every year Habitat workers show us the gifts they have received in prior years, and tell of their anticipation for this year’s. This aspect of service shows that mission goes beyond work with a hammer, and also shows that even the youngest team members find their own way to serve for God’s glory. After an evening of swimming at the pool, exploring the campsite, and playing cards with friends, the team all sat down to have a lovely Dinsmore dinner (reoccurring theme so far) and celebrated Elena Barham’s birthday with chocolate chip cookie cake. We sat around the fire (the weather allowed us to have one this evening) and sang songs of worship. After an evening devotional by Dawn Crowson, the team all staggered off to bed at their own pace, each of us preparing for the early morning and long day with Habitat ahead of us. Thankful for all the love and prayers from our SUMC family so far.